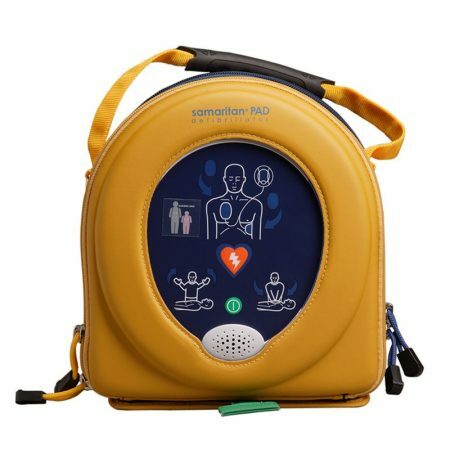 Defibrillator HeartSine Samaritan PAD 500P Defibrillator FREE Wall Cabinet & Delivery from the Australian supplier to 2018 Commonwealth Games and parkrun Australia, First Aid Accident & Emergency are a 100% Australian owned, defibrillator specalist. This HeartSine 500p Defibrillator Value Pack comes with everything your workplace needs, including an alarmed wall cabinet, patient prep kit and signage. HeartSine 500P AED is a must for any workplace, sporting club, outdoor area, marine and aircraft compatible and very durable. 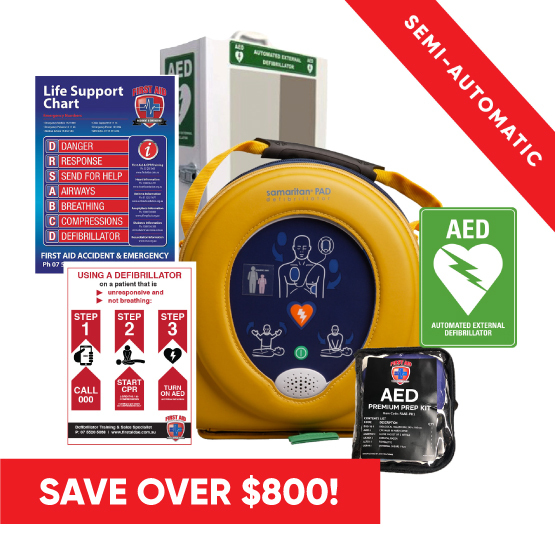 Purchase a Defibrillator from one of Australia’s most trusted suppliers and receive a FREE training video, AED signage and the best after sales service. 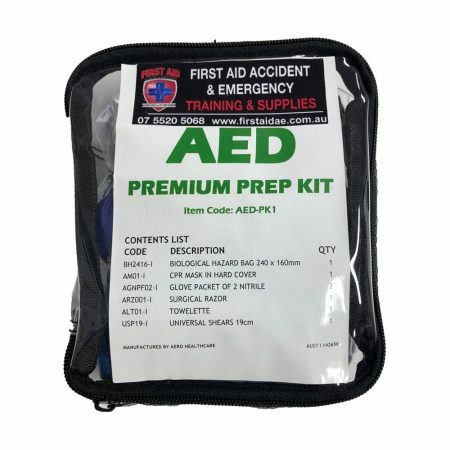 Defibrillator Package HeartSine Samaritan PAD 500P FREE Wall Cabinet & Delivery from the Australian supplier to 2018 Commonwealth Games and parkrun Australia, First Aid Accident & Emergency are a 100% Australian owned, defibrillator specalist. This HeartSine 500p Defibrillator Value Pack comes with everything your workplace needs, including a cabinet, patient prep kit and signage. 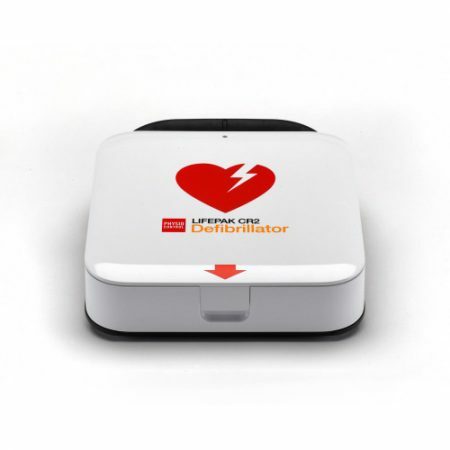 HeartSine PAD 500p AED has CPR Advisor is and intelligent Defibrillator with real time feedback on CPR, it is lightweight, easy to use, has a 4 year battery and pad life with low ongoing cost, 8 year warranty and one of the highest weather rating in its class. Purchase a Defibrillator from one of Australia’s most trusted suppliers and receive a FREE training video, AED signage and the best after sales service. 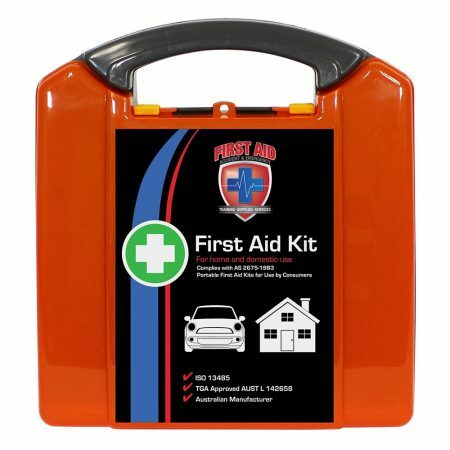 First Aid Accident & Emergency supply defibrillators all over Australia to the largest organisations including the 2018 GC Commonwealth Games, parkrun Australia, the Mantra Group and many more. The HeartSine® samaritan® PAD 500P defibrillator with integrated CPR Advisor™ is the most innovative AED available, giving rescuers feedback on the effectiveness of their CPR efforts – in real time. This Defibrillator has become the new gold standard in the defibrillator industry. With a light-weight design and easy to follow verbal instructions, the Heartsine Samaritan 500P is a must have addition to any office or commercial space.